Do you have “gray fatigue” yet? Because there doesn’t seem to be any end in sight to it. I’m glad they’re talking about warming the tones up a bit this year because the cool grays can sometimes leave me, well, cold. I groaned when I first saw this coming back. We worked hard to swap out all the shiny brass doorknobs and light fixtures in our house. But I like the fresh ways people are using gold in their rooms now, which warm up all those gray rooms out there a bit! I’ve noticed some backlash against this (online, at least). I know whenever I show a room that has any kind of taxidermy in it, there’s a vocal number of you that strongly dislikes it. Are you one of them? This one interested me because I’ve been shopping for an area rug for my family room. They come in some beautiful patterns and colors. Accent walls seem to be more popular than papering entire rooms these days, like they did in this bedroom. Have you been convinced to try it in your house yet or are you resisting this trend? I have to say, though, I think people are starting to appreciate the look of beautiful wood in rooms again after years of painting everything in sight. I know I am! Light fixtures definitely seem to have taken on more importance in decorating than I remember them having even ten years ago. Most of us used to live with the standard fixtures that came with our houses and not think twice about them, but we’re not content with the basics any more, are we? What other trends are you seeing? I’m surprised Gallery Walls like the one shown above didn’t make the list. I think they’ve gotten more popular as more people try to figure out how to fill the blank walls behind their new flat-screen TVs. I also think the color navy deserves a mention. It’s popping up everywhere. What do you think? I’d love to hear your thoughts on these trends and the others you’re seeing. Which ones are you loving right now, and which ones are you hoping have had their day and will go away? Are "Closed Kitchens" Making a Comeback? Are TV Armoires the Dinosaurs of 2008? Taxidermy is a big no as far as I’m concerned. Yuck! Love taxidermy. Duck Dynasty and Alaskan style will be big. Elities will not tell me how to decorate! Yes, I will. No taxidermy for you! Elities has spoken! I guess that settles it, then. LOL. I’ve never been a trendy person. But living in upstate NY where we get over 200 cloudy days a year, I’m not planning on going grey any time soon. I need bright interior colors just to survive the winter. I totally agree! I lived in Seattle for 6 years and got pretty depressed there. I did just “go gray” swapping out my beige walls but any color with “gray skies” or “Seattle mist” kinds of names were nixed. Silly maybe but I couldn’t handle the thought! I now live in Denver so the gray won’t kill me on the walls. Agree with Bermuda-taxidermy is something I can’t stand – never have and never will. I love warm grays, colorful front doors, pastels and statement light fixtures. I dislike taxidermy, always have and I suspect always will! I’m not a huge fan of wallpaper – stripping it when you’re sick of it is hard work! I’m still not fussy about gold and brass although I like aged brass (not antique brass but real brass that has tarnished). I love painted furniture, especially when you have one beautiful wood piece to show off. I love dhurries and schoolhouse, I love the brightly painted front doors – I just painted my last summer and it pops! Gray is not my fave but I am a little tired of beige in all its tones, there must be another neutral I can embrace 🙂 Nice recap of trends, thanks for sharing!! Since I am one of those people who never switched out the brass doorknobs, I am happy to see some brass again! I love painted furniture and am about to check out that link to that colorful cottage! Our front door is black but I love colored doors on certain houses. I have a schoolhouse light in my laundry room so I guess I must be trendy there! Pastels don’t work in my house but I may add a pillow or an accessory or two in my home office. My house has a lot of earthy tones so moving to some grays will be a huge project! Not sure about it yet! Fun post! It’s like they say, wait long enough and everything will be trendy again! I can’t stand the taxidermy trend. I’m so tired of seeing just about every blog jump on board. I’m tired of seeing everything painted, especially in chalk paint, as well. I love it when someone takes an old piece and restores the natural beauty of the wood. It’s not on the list but my personal pet peeve right now is burlap! Why oh why must everyone in blogland do the same trends over and over, especially when they are so overdone already! Try something new and different than the herd! That’s what I do in my own home. I should have mentioned the chalk paint. So trendy right now! Good point about the burlap, too. Lots of that around, as well. Thanks, Abby. I am a NO to the taxidermy as well. Also the brass and gold. Not a big fan. I love the pastel colors, and the statement light fixtures. There are so many fun ones to choose from these days! Just about to do a living/dining room re-do with fresh paint and light fixture in the dining room. There are so many choices!! We’re currently re-doing a Dutch colonial, + I’m especially excited about ordering warm antique cooper light fixtures + schoolhouse pendants. Warm gray is my go-to neutral already, but I am trying to incorporate pastels into our gray, red + navy décor. TY for another great post, Julia! If it is ugly, dingy, and tacky BHG loves it. Too bad they are not alone. Think most women like pretty things and that Downton Abbey is having a big influence in a return to more ELEGANCE, Sales would pick up in stores if the merch was more appealing. Awesome article! I am a designer and just did a piece like this for a local publication. This is one of the best trend pieces I have seen. I personally am out growing the painted second hand furniture. Ps I love your site, Thank you! The concept of trends is a funny concept. Is it human nature to want to run with the pack? Not feel excluded? Greige (not yellow tinted) and silver tones are staples of mine, not because they were trendy but that is my style. You will never find taxidermy in my house. My old walls are textured plaster so wallpaper is out for me regardless of whether or not I’d want it. My front door is a fabulous turquoise color, because that’s how it looks best. Except for dhurries and painted furniture… none of those will see the inside of my house. Feels like the 70s to me! I love French country and English country which includes decorating with the antler trophies. I only use the antique roe deer antlers on the hand carved oak plaques. Many of my fave designers use them, too. I do have one greige room and I have been adding brass/gold accents over the last several months without thinking about it being a trend. I don’t really follow trends. I just decorate with what I love. Trends are fun to see but I don’t follow them. I once read some great advice for decorating. Do what you love not what is popular. I have to live in my home, it is not a showplace for a magazine. So, trends don’t really affect me. I will say, that I HATE brass and no matter if it comes “back” or not I will one day get rid of all of it from my house that we built in the 90s. My husband saw it as a rich looking feature back then and I went along but I have always hated it. I definitely don’t follow trends. I use what I like after much consideration and then don’t change much over the years. I would call my wall colors muted pastels, kind of dulled down. I’m not a fan of gray, but warm gray is better than cool. Taxidermy is very cool in an old estate-type house. I don’t think I’d take the plunge to have it in mine. Gold and brass? Yes, if it’s old and has some patina. Not shiny. We have a red front door, but I prefer traditional colors like that – not lemon yellow or hot pink. I don’t think I’m really into statement lighting (I particularly dislike the gigantic lantern pendants) but schoolhouse lights are fab. Painted furniture – yes, and wallpaper – yes, but not just on one wall. If I could afford to have William Morris wallpaper in a room or two, I would be SO happy. Wallpaper will be forever OUT in my personal world. Also taxidermy but my feelings about that are not as strong as how much I hate wallpaper! I love warm grays but pastels not so much! Great article! I really like the grey. Beige, to me, is so dull. Hate the taxidermy, although the antlers aren’t as bad as those awful heads. I love the pastel colors. My house is a white colonial with black shutters and my front door is raspberry. My decorating style is traditional, so I’m not really a “painted wood” kind of gal, alhough it can be fun for an accent piece (or like the cute bedroom you featured). I also like the idea of mixing things up with a fun color for the front door .. my neighbors across the street painted theirs purple, and it’s a perfect compliment to their eggplant shutters and greige trim! I might just get bold myself this spring, when it’s time to repaint my old abode. My Love: Wallpaper. Does anyone else notice the gorgeous wallpapers in those “period films” on indoor home scenes? I mean in movies where it is supposed to take place in the ’50s or earlier. Wallpaper gives a home such a personalized, homey look. Plain white or painted walls are so clinical to me. If I find a home already papered (as long as it is presentable) it stays. Do you know how much wallpaper COSTS? Hates: painted furniture. I wince whenever I see a previously beautiful, antique or vintage piece made of nice wood painted. Especially if it is a trend color that will be out of style someday. What the heck is wrong with good old WOOD? I feel the same way about people who re-do vintage 1950s homes and paint all of the builtins and paneling. Wood is so… warm. 🙂 Jessica, you know what’s interesting about those old TV shows- I was flipping channels the other day and “Davey & Goliath” that stop-motion kids Lutheran show was on. Oh my gosh- the furniture!! I never noticed it before, but the designer recreated all the super cool early 60s mod furnishings: the couches with the builtin side table/armrests, the “space age” lamps, exactly as the full-size real stuff looks. I can no longer watch HGTV’s “House Hunters” as the prospective buyers sneer and jeer at the perfectly preserved pink bathrooms and wood cabinetry in the kitchen. All I hear is “this needs UPDATING” and “this is ghastly”. I’m laughing as I read your post because I had just signed off from an online wallpaper site looking at Damask wallpaper for my 23yo daughters bedroom. She found it on one of the blogs she follows by a young woman that just moved into her own condo. I have always loved wallpaper and I’m glad to see it come back as an accent piece. I agree with you and Pamela on grey walls, I am here in the midwest with yet another winter storm and everythig is grey. That is a trend I think I’ll let pass. I love the taxidermy thing when it’s done right. Faux, so nothing dies; colored to be interesting; and location appropriate. I live on the edge of woodlands, and I think a white faux deer head would be awesome. A friend who loves Africa has a white faux elephant in her living room. It’s just the right scale and just the right bit of interest. The taxidermy thing will be gone in 15 minutes. It doesn’t bother me, but it’s not so much a reflection of people’s actual taste as purely trend. I do not believe there has been a pent up demand to hang white painted skulls that is only just now being allowed by society! And trends for trends sake is kinda boring in a house. I like to see things reflect the owner’s preferences. I never liked the grays. I’m not surprised they are being changed to something more pleasant on the spirit. I don’t think they’ll last long now. That is beautiful. I like it as an accent like that! You inspired me to go actually DO something with the house today. I just went and painted tested colors for the front door (it’s already red, but it doesn’t go with the house). Well, since you asked…I do not understand the taxidermy love, particularly the white ceramic heads that are so popular among younger house bloggers. Not my thing. Did you notice that photo no. 6 (for wallpaper) also features an animal head on the wall? I don’t get it!!! Whew. Thanks for letting me get that off my chest. Of the 10 trends you mentioned only 2 are on my “to-do” list. I want to paint my front door a bright color and I have a very old set of CHEAP bookcases I want to paint something other than faux wood. The long term plan is to rip up the 5 year old carpet and replace the floors then I can get built in bookcases so these have to suffice for a year or two more but I just can’t live with the ugly! The trends I can’t stand are taxidermy, chalkboard, burlap, words and white on white. Oh and the “furniture” look in kitchen cabinetry. All those curlicues to clean! Schoolhouse is growing on me and I really want to replace the builder light fixtures with something new so maybe that’s why I’m leaning towards that style a little. I hope other bloggers read todays post and see that not everyone is on these bandwagons as much as the boggy world. Good post! Chalkboard walls! How could I forget to mention those? That’s been such a huge trend for the last 5 years or so, with apparently no end in sight. Good point about the furniture look in kitchens, too. Another growing trend. Thanks, Susan. Honestly I am wondering when pretty will come back. The Creation if Beauty is Art. I love brass. Real solid brass without that shiny coating is lovely. I’m doing my kitchen now and plan for all the hardware to be satin brass finish. No apologies! I agree with you 100%. You made some great points. If BHG says they are” THE 2014″ trends you can be sure that we will be seeing them a lot. I have been noticing Navy blue too. I am glad to see the Chevron was not included, tired of that look and Taxidermy was never my taste. Now my guest bathroom will be right on trend, I have a wallpaper with a black background and lush lilacs and pink roses. It’s a Victorian/ 1940’s look but it still looks timeless. I can guarantee there will never be antlers on my walls. I really like the taxidermy – especially all one color (white, black, etc…). It makes a room feel more masculine without it having to look like a cabin. They seem to go with so many different styles too! Things I like: I have old brass hardware all over my house. That I’m keeping. I’m not going to replace it with the shiny brass though. Depending on the piece of furniture, I don’t mind if it’s painted. It does freshen up pieces sometimes. I also love painted front doors. I love the fact that light fixtures are in. And they should be. So many wonderful choices out there. Things I don’t like: Wallpaper. Almost every room in my house had wallpaper. Several layers of wallpaper, with paint in between some layers. Oh so much fun to strip. Plus, it’s difficult to install if you don’t know what you’re doing. Taxidermy? No. Not my thing. I feel a bit let down by their list. Painted front doors have been raging for a while. Taxidermy feels very 2013 to me, not 2014. Painted Furniture and wallpaper have been going strong for a while. I think it will be interesting to see if more pastels make their mark this year- it’s not my thing, but I’d like to see what designers do with it, if things do go that way. Schoolhouse style- I think that’s an interesting forecast. I love a little schoolhouse edge in a kids room, or as an industrial touch in an adult space. I’d love to see that popping up more. I love reading different bloggers perspectives on they are liking/disliking for the new year. I can’t say that I have any predictions myself, but its interesting to see what other people are seeing make appearances. I grew up in the boondocks and many of my relatives who still live in that area have taxidermied animals in their homes that they personally killed. I would never have something like that in my house, but I understand why they do. I live in an urban area now and I would be horrified if somebody here actually went out and bought a dead animal to display in their house. That’s a trend, now? Give me a break! I have several faux deer heads and I love them. I don’t care if its trendy or not, if I like it, I like it. I live in a 1911 farmhouse and while the upstairs woodwork is white the former owners left the beautiful woodwork on the first floor. We have a lot of mid century modern pieces which we love but none of them are painted. I do like painted furniture however. I just stripped down some wallpaper and painted the wall. I do like gray walls when matched up with crisp white or bright colors. I also love navy paired with aqua and orange. My daughter switched to gold lamps over a year ago which I didn’t like but it has grown on me as I now have added gold to my LR/DR which is beautiful with the warm wood. I am not crazy about dhurrie or cotton rugs. They seem to always roll and bunch up really easy. As for wallpaper, it really depends on the design and color. I saw some beautiful damask wallpaper in a magazine recently that was in a bathroom and it was just gorgeous. However, personally I don’t think I will go back down the wallpaper route again because of the labor involved to remove it. Interesting. I have had the warm neutral wall colors for over 10 years. It just works here with the accents in brighter colors. I like yellow undertones…not the cold blues. We still have our original brass. (LIke you said, just wait and it will come back around again.) No pastels, taxidermy, or wallpaper anywhere here…although I think I would love grasscloth somewhere in this house. (I truly do not “get” the fascination with the white skulls or goat heads or whatever on the walls.) I have always liked a piece or two of painted furniture in a room…not the entire room full, and brightly colored front doors are great. What do you think of the trend of interior doors painted black. Am I just late in noticing that, or is it a coming attraction? That’s another good one to mention — painting interior doors. Lots of that going on lately, it seems. I think it can look pretty sharp but I’m not sure I’d want to go to the trouble of painting mine, myself. Ha. “Trendy is the Last Stage Before Tacky” – love that, Janet! Hmm, can’t stand real taxidermy, and now all of it, real and faux, is way overdone. I have a (vacation) log cabin and 6 or 7 years ago I almost bought an antique Black Forest wood deer head – liked the carving and it fit the rustic look. I guess it was the start of the trend, so now I’m glad I didn’t go for it. And too many antlers are a log cabin cliche, so I’ll pass. I’ve always liked pastels – they can be so pretty – but I prefer them in the bedroom. I’ve always preferred wood with a beautiful patina, but I agree that some of those old pieces with terrible finishes look better painted. The brights look cute in a beach cottage type of setting or a child’s/teen’s room, but I prefer the chalk paint – in small doses – for their antique look (not the same thing as blackboard type chalk paint). It really depends on how vintage the piece is what works best, but I don’t care for a French Provincial dresser, for instance, painted a bright bold color to give it modern appeal. I love the look of warm woods against a chalky white background, but am very tired of all white rooms. Grays can look elegant in the right setting, but they go cold on me, too, and would never work in my house, anyway. I’m rather tired of the monochromatic look – white or gray, though some stylists pull it off nicely. Working for a builder in the 80’s and 90’s, we did so much wallpaper that I got thoroughly sick of it. It gets dated so quickly and is a pain to get rid of. Perhaps only in a powder room or dressing room. I’m all for aged brass with patina (not shiny lacquered bright brass) and colorful front doors. My cabin door is on the green side of turquoise and my primary home door is a deep royal navy – indigo, perhaps? That’s supposed to be a big trend now, as you pointed out, but mine’s been that color twenty years or more. Looks wonderful against white painted brick and still very traditional. Some statement lighting but I think the huge drum shades on hanging fixtures will end up being dated. Generally, I feel that when something becomes a trend I’ve already gotten tired of it, even if I liked it to begin with. That’s the risk of reading so many decorating magazines and blogs! Good discussion. I like most of the trends. However they don’t seem all that new. The “accent wall” is something that I remember when I was a child. My mom was an Interior Designer and she was so excited about it. Taxidermy I don’t mind at all. But then I’m from Texas and come by it naturally! Pastels, yuck. Reminds me of the early 1990s! I guess it all comes around again (like brass). It’s funny that you mention that, Tanya, because I remember when a friend of mine got a brightly painted “accent wall” in her bedroom and explained the concept to me when we were kids. I was like, “oooh, an accent wall!” I still remember being so impressed by that. Ha. Great post, Julia! It’s interesting how many people react so passionately to the trends listed – both good and bad. My personal mantra is to do what expresses your own creativity and wraps you in ‘home’…if that makes sense. That means sometimes I’m right on pace with popular trends and sometimes I’m not. 😉 That’s okay with me. I want our home to reflect our family’s tastes and preferences. Never have been a fan of grey (or gold)! Love wallpaper, and painted furniture. We bought a cabin in NC that came fully furnished (UGH) including taxidermy. Two bucks, two ducks, a pheasant,…..(not awful)…. BUT we also inherited a scary bobcat head, AND a squirrel….right on the living room wall! Who knew I was trendy? One of the DUMBEST decorating ideas (I dont think it ever made it to “trend”) was putting books backwards on the shelf, only showing the pages. How stupid was that? That whole “backwards books” thing was a sort of short-lived trend, wasn’t it? I think people realized it made it pretty hard to find what you wanted off the shelf. Ha. i have always loved and have always had some form of taxidermy in my homes. it may be antlers, a cowhide rug, turtle shells, sea shells, etc. it is a form of nature and it brings a bit of texture to my home. i decorate my home for myself and my family! I am painting my beige/tan living room “Gray Clouds” by SW. It’s not cold at all. It’s elegant in my opinion. But then I do live in the sunny and often hot south. What I dislike is people saying “I don’t like something, so I predict it will be a short lived trend”. Decorating is all about trends; some may last 6 months or 16 years but in the end there is nothing new under the sun. Difference is what makes us unique and I wish people could be more gracious in their opinions. I am so tired of the painted furniture trend. Most of the items I have seen around my local antiques mall aren’t even done well. I think some dealers see a trend and slap on the paint. No thought to it. I am glad to be seeing the return of natural wood or stained furniture pieces. Also glad to see the return of brass and gold. They will add some warmth to interiors. I am confused by this list as a lot of these are things that have been around for quite awhile already. I still like a lot of them (not the taxidermy though) and I never, ever thought I would like gold tones but, lo and behold, even I have a few brass animals around my place now. I do think it is a reaction to all the cool colours that have been trending for so long. Plus people just get bored and want to do the opposite of the current trend and then that becomes a trend only to be replaced by the opposite thing again! Ah, I don’t have very many hard and fast rules but I do generally stay away from my whole house looking ‘trendy’. I agree with that quote above ‘trendy is the last stage before tacky’. Ha ha, love it. My general philosophy is to just do what you love and enjoy having around you. If that is a 6 ft tall brass flamingo, then go for it. What does it all matter in the end anyway? I like most of this top 10 list, especially the school house look and the warm gray paint trend. I’m not super keen on the pastel decor….and I don’t know one straight man who would be happy with that in his living room! 🙂 I intensely dislike taxidermy. There was a huge taxidermied fish hanging above the front door of our cabin when we bought it. “It’s for good luck” said the previous owner “Caught it myself right here in this lake!” In an effort to be polite, I smiled and nodded. Needless to say, the pike came down as soon as he drove out of sight! I find all the opinions here very interesting. Julia, I really enjoy your blog and post comments now and then. I am kind of confused and bummed that the comments I made on yesterday’s blog (Storybook cottage) were not posted.I did find some faults with the cottage, but I don’t think what I wrote was mean spirited, just honest. I approved your comment, Martha, but it does bother me when I feature a reader’s house and it receives what I feel are unnecessarily unkind remarks about their home. That’s one of the hardest things for me as a blogger, and I’m still trying to figure out how to deal with that. Moderating comments is one step I’ve made toward trying to keep the conversations friendlier around here. Julia, you just gave me a new perspective on my comments. I love to hear what people think of different styles….but…..I see exactly what you are saying. I did not take into account that this was a reader’s house and that my comments would put you in a difficult situation. That was not my intention…sorry. No problem. And I really didn’t intend to hold your comment in the queue that long — I had forgotten about it until you mentioned it. Thanks for understanding! Yes to Gold/Brass, Dhurries, Bright Front Doors and Statement Light Fixtures. No to most of the others 🙂 And I’m glad to hear I’m not alone in not caring for Pantone’s color of the year!!! Thanks for sharing! It was fun to see the predictions. Schoolroom style and colored front doors are my two favorites! I’m not sure most of these are new trends, necessarily…but the warm greys? Yeah, not happening for me. I’m not sure about the gold-tones either. I remember seeing pics from a recent kitchen done by Sarah Richardson and I was stunned to see all of the brass-y fixtures. Isn’t it still too 80’s? Or, is that what’s made it cool? I think I know the kitchen you’re talking about, Brandy. She’s another designer that’s been going big with the brass trend lately! Love that theory, Debbie! Maybe that explains it. Ha. No taxidermy!!! What a turn off. Any site, blog, etc I don’t keep reading (made an exception today!) if I see taxidermy. It could the best home ever, but I will none the wiser. And what is it with the faux taxidermy – the cardboard antlers? No to grey, I prefer light and airy. No to pastels as well, it comes over as wishy washy. The one trend I will never like is wallpaper. I don’t like how difficult it is to remove and it can look outdated or tacky. I also don’t like gold or brass fixtures. They remind me of the 80’s and 90’s, but at least with these and the other trends, they’re easier to replace than wallpaper. Plus I could put with them. I think the BHG collection of trends are a bit more mainstream — I think recall seeing some more forward looking publications saying that taxidermy was now out. The design thought leaders have been foisting brass on us for some time now — at least two or three seasonss ago…. and warm greys have been around for a while (love). I love wallpaper but don’t have the heart to put it up. In my recent remodel I mixed satin brass hardware and antique golds finishes; to mix with the existing brass. All on warm grey painted woodwork — more out of necessity rather than anything else. Probably making a lot of people cringe (no taxidermy or pastels for me though). I love mixing metals and wallpaper and stencils and warm greys…and updating good furniture. Fun post. I think unless you bagged that bear yourself and you live in a state in which it is found in the wild it’s a no on taxidermy. It’s a definite no in any situation in a bedroom. I don’t want Smokey the Bear staring at me in my sleep. I know I could never decorate my house with an animal like that on the wall but I can appreciate it in the right setting. How do you clean it? With a brush? Carpet shampooer? Ick. I’m also (sadly) over turquoise. I still like it in small doses like the front door you showed but no to whole houses decorated in it. Like others have stated, I don’t really buy into trends. One reason is that some of the “trendy” stuff is so damn expensive and the other is it is not my taste. I dislike Taxidermy, but it does work in some people’e homes. I do hate open shelving and always will. I do not deny that most of the time it does look nice, but everything looks better when staged for a photo shoot. Eames chairs put me in a twitch as well, but again, along with open shelving and say antlers, if it has always been the homeowner’s vibe and it is done right, it will look great and I can appreciate it. Can you read my mind? My mail? You land exactly where I do on each of these trends. My biggest peeve is the painted wood–particularly for large pieces. If I see one more lovely antique furniture painted neon turquoise or intentionally battered, I will be tempted to splash paint stripper on it. who knew I was on trend for myself and clients BUT taxidermy might not be a trend I lean towards, yuck. I just ordered a set of Roe antlers from One Kings Lane, but I have always loved them and Charles Faudree and other designers have used them for years. I do not want a huge animal head on my wall but I respect those that do. I live in Oklahoma so it is only natural to see them here. I love wallpaper but would limit it to a bathroom. I have been collecting many of the items that are all over the blog world for years. I think classic will never be out of style. I hate theme rooms. I like painted pieces mixed with gorgeous wood furniture. I have been painting furniture for years and when you are just starting out it is a great way to rehab dull, tired furniture for little money. However, I prefer classic colors over turquoise, etc. Love antique brass and all the gorgeous lighting that is shown recently. I hate shiny brass and I am also tired of oil rubbed bronze. Thank you for all your wonderful posts. I enjoy reading your blog! I’ve never been a fan of taxidermy when it comes to an actual head on the wall, but I do like skulls (but, one is enough or else it ends up looking like an exhibit at a museum.) Never liked pastels. I like the wallpaper accent wall trend, but again if it’s confined to one or two rooms, otherwise it looks like a gimmick to me. I’ve noticed over the past few years this practice of mixing patterns get way out of hand. It’s one thing to mix, but too many and it just ends up jangling my nerves. Thank you for this article. I’ve also enjoyed reading the comments. I enjoy reading design trends and decorator blogs to get ideas or look for a way to solve a problem I am having with a space, but I never go with a trend just because it is a trend. In fact, if I see too much of something, I tend to avoid it. I first saw the trend in grey at last year’s Parade of Homes. I thought the same thing others have said. In June, it wasn’t bad, but I didn’t think I could take it in February – and given we are having one of the coldest, greyest winters on record, I don’t think grey all over will survive. One trend I did see that I liked was using cabinets of different color and style in different rooms – the bathrooms did not match the kitchen – and using more than one color or wood type – white millwork with wood cabinets or cabinets one shade while the island was a different. One trend I don’t like is the huge kitchen – the newest waste of space for your average family. There are six in my family and we manage just fine in an average kitchen. I think people should decorate with things the love or have meaning to them. We should not focus so much on what style of cabinet or hardware is “in” – too wasteful to change those things out just because the designers have deemed something passé. I will not change the placement of my curtain rods one more time – too hard on my walls. I try to think a little about not filling up landfills with discarded design ideas. To help keep a look current, I try to keep the bones of my house done in time tested designs – real hardwood floors, white or neutral bathroom fixtures (sink, tub, tile), six panel doors or similar, sturdy millwork. I prefer natural wood finishes, but I don’t mind a piece being saved from the dumpster by paint. I appreciate artistic talent – lovely roses painted on an old cabinet or chair or just framed. I’ve been reading your site for a few weeks now and I love it. I especially love the cottages and the cottage look. Some great points here. The cabinets that don’t match seems to be a growing trend. I’m seeing a lot of that, too. Lack of matching in general, actually (metals, wood tones, etc.). I think that’s smart to stick with “classic bones,” like you said. I also agree that you should never go with something just because it’s a trend! Enjoyed this article, Julia! I think the whole taxidermy thing will look dated within the next year or so. I could be wrong. I think the brass will stick around a while, along with warm gray paint and bright rugs. I love natural wood on beautiful furniture, however, I can see why paint is necessary for some pieces! The painting of any and all furniture may be getting a little out of hand, imo. I’m no pastel (orchid) fan, either! Front doors in colorful colors will stick around, because it is an easy way to freshen up a house. Ta-da – Am sure you wanted my opinion! Hate the taxidermy trend. Also painting everything with chalkboard paint. And I’m pretty much over the gallery wall, too. I think it’s because all 3 of those things are EVERYWHERE, and I feel like I see the same pictures over and over. I like a little individuality. I want my house to look like “me,” not a Pinterest board! I’m crazy about pastels, gray, schoolhouse, and industrial lights. I had no idea I was so en vogue. I have seen some beautiful wallpapers as of late (I especially loved the one featured in that million-dollar mobile home), but every time I start to waiver, I remember the months I spent scraping rooms worth of wallpaper from our first house. My hand cramps just thinking about it. It’s interesting, it seems a lot of these trends have been around for a few years…painted furnitures, taxidermy, gray, etc… I’m sort of over gray, and although I like a fun painted piece every now and again, I think it’s often overdone. I think every home needs some beautiful warm wood. About 5 years ago I was having a conversation with my neighbor and friend. We were talking about how we were starting to see gold and how it was predicted to make a big comeback. We both groaned, but here we are a few years later, and I’ve added a few warm burnished gold pieces to my home (and I’ve noticed she has too). I love the warmth they bring, and that surprises me. Does this mean I will start embracing “Radiant Orchid”? Probably not. I can’t help but think of all the “blush and bashful” bridesmaid dresses I had in the 80’s when I saw that Pantone color this year! Bridesmaid dresses are what come to mind for me, too, Erin! And a lot of the ’80s pastels in general that I’m not keen on reliving. Ha. To me it all depends on how they pull those things together. I am not a fan of beige or tan things though unless it is a good leather sofa. ~Grays: Always! I love their versatility. Coventry Grey by BM is a current favorite. ~Gold & Brass: Embracing more & more! Gray with yellow and reddish undertones? Doesn’t this equal beige in some form? Im over gray and beige….time for white hues on my walls. No to faux or real animal head parts. Yes to wallpaper, but couldn’t do it with plaster walls. The photo has done this well, not sure if many could pull that off decor wise. Not ready for full room wallpaper. Gold/faux brass isn’t my thing either unless a treasured object, but fell for brushed nickle and regret it. Any direction I have to replace is another trend. A gallery Wall has always had a place in my home. But this is typical of a trend….when stores sell packages with frames and a layout to hang them. The lighting fixture trend caught my attention. It didn’t address the way new light bulbs give off a cooler light and change the way colors work in a room. It’s not a change for the better, in my opinion, and since these bulbs are so expensive and last for such a long time, what should people do? I don’t know what the answer is, but it bugs me, too! I actually like some of the faux-taxidermy I’ve been seeing. Clever and animal-friendly. Regarding your comment on gallery walls, I am in the process of filling an entire room (our music room) with paintings, prints and small wall art, much like I see in pre-war NYC apartments. They go from the wainscoting to the ceiling with tight spacing. It’s a great way to use all the art I’ve collected over the years. Love this site, BTW…. My husband and I really went for the schoolhouse style when we bought a card catalog and a set of those pull-down classroom maps at a school auction recently. See and read about them here https://lasthomebeforeheaven.com/category/around-the-house/decorating/. I didn’t think about it as being trendy, we’ve just found that a card catalog is great storage for small items normally lost in a junk drawer, plus the maps added a nice pop of color. We have 1940 Europe on display and enjoy discovering all the changes in country names and borders. That’s very cool. I love it. Thanks, Sue! I ADORE the taxidermy trend. Naturally shed antlers are a beautiful thing and add a touch of nature to a home. This “trend” has been in some of the finest homes I have visited since I was a child , even in Europe. Classics never disappear, just fakes. taxidermy–like it, as long as it’s maybe, one, interesting piece…not a flock of dead ducks flying around a herd of mangy deer heads wearing hats. wallpaper–love wallpaper, but am too timid to put it up as i know that once up, i will never take it down and taste in wallpaper can change so drastically very quickly. gray/grey–love it! think it is a fantastic neutral that works with almost everything. and, there are so many hues to choose from. painted furniture is always good and a great way to transform a not-so-great piece–i love one piece of black, painted furniture in a room. like the bright colors for kids’ rooms and fun places, not so much for my “grown-up” spaces. 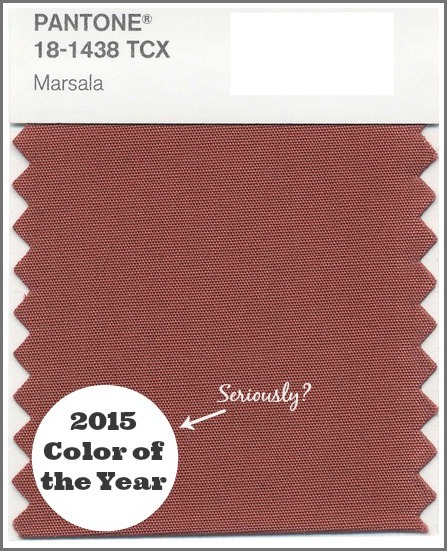 orchid color of the year–surely someone made a mistake and posted the wrong color when this was proclaimed color of the year! statement light fixtures–this is a classic and one of the first things i notice. a good light fixture can transform a room (i hauled two antique chandies, one found chandie and a set of antique sconces from alabama to indiana when we moved :)). love reading everyone’s opinion on the trends! Other people have mentioned chalkboard paint and gray walls already. And, in a slightly different decorating context, the widespread and usually inappropriate use of the word ‘vintage’! Interesting point about “vintage.” That has really become a buzz-word over the last few years. Just checked out another favourite blog and saw another pet hate of the moment – empty frames on walls. Again….WHY!? Love the fact that wallpaper is making a come back! Gold/Brass, no thanks. And really not into dead stuff hanging in my house. The colorful front doors is refreshing too! I’m not a trend follower..just do my own thing. I don’t like all the gray or all white I keep seeing in magazines (gonna cancel my subscriptions if this keeps up)..I must have colors and patterns, variety. I love warm natural woods and ‘tho I like some painted furniture it’s gone overboard with the chalk paint & shabby chic. No taxidermy or antlers for me either…and never will granite come into my house. I think I agree with all your comments except the taxidermy & antlers. I can see them in a “man cave” or pool room. And I did cancel my ‘script to AD because of how ugly the rooms are. If you are going to pay that kind of money for a decorator they better know there are more colors out there besides white and gray. I call that the opposite of color. I will be glad to see gray and any kind of animal heads, fake or real go away. It’s interesting to see trends come around again, like gallery walls. I was dong those in back in the 70s and 80s! Sure wish we had digital cameras back then. It would be fun to have pictures of some of our old houses. I love all the houses you show us. I blogging again and so glad to visit you again. Hi Rhondi! I wish I had a digital camera when I lived in my other houses, too. Also wish I hadn’t put off getting one for so long. Early photos I took of the house we’re in now are pretty terrible, and if I ever want to show them on the blog I have to scan them. The quality is never very good. The one trend that I am not fond of is the bench on one side of the dinning table. It may look good but I always pity the peeps who get stuck eating on that side of the table. It’s nice to have a back on a chair so you can lean back occasionally. The only place I can see using them is at a picnic table at the park. I agree. We had to go with a bench on one side of the table in our sunroom because we were short on space out there. The kids don’t mind sitting on in but I avoid it at all costs. Ha. I sort of like warm grays. School house style could be neat. I do appreciate nice light fittings. Not sure about colorful front doors. I really enjoy this post and the comments! Regarding the painted furniture trend: There’s also the super-trendy distressed paint furniture look. I like it to a point, but I’ve got enough second-hand furniture that looks that way naturally without my help, ha ha. I recently painted my bathroom cupboard with the full intention of distressing it. But after applying the paint, I was delighted at how nice and new it looked with a fresh coat of paint. It makes my bathroom look less dingy now. But I totally understand the appeal to *minimal* distressing. It’s like when I was 13 and got a new pair of jeans. I wouldn’t dream of wearing them to school all shiny brand new! They had to see some serious distress before they were cool. But I’ll be honest. I hope that trend fades… pun intended. “Karate chopped” pillows – haha! I never thought of it like that before, but that certainly is the trend, isn’t it? I must admit I’ve been trying to do that with my own couch pillows and they refuse to stay chopped. Ha! Not a fan of wallpaper – my house is covered in wallpaper, every single wall, from the previous owners. All professionally hung in the 80s, ridiculously difficult to remove. Two trends not mentioned I am beyond sick of – granite countertops and ss appliances!! Love your site! WOW! That’s a lot of opinions! And to think we have so many options, it is amazing! I have to laugh when we talk trendy, because some of these same things were trendy 20-30 years ago! Even the Pantone Radiant Orchid! Fifty years ago my parents bedroom was purple (at least that is what it was called in 1960) and my mother antiqued the furniture, which back then antiquing was a white wash with faded gold trim. I always loved that room. In my opinion if we do what we want to when we want to we will always know that we are being true to ourselves and that is what matters. Loved this post. My house is over a 100yrs old and the door is solid oak. I wanted to paint it red, but I just couldn’t! its worked very hard for it’s weathered look. Yeah, I think that was a good call. I’d hate to paint over a door like that, too! I’m from Texas so it’s not exactly a trend here, but I’ve never been a fan. I’ve worked places that have animal heads hanging and it just weirdo me out and makes me kinda sad when I see those big eyes. I just stumbled across your blog and decided to chime in on this very interesting topic. I’ve never been a trend follower although my taste has definitely evolved thru the years and a lot of that is due to traveling. I got a kick reading the comments about taxidermy because I agree with the majority here, not pretty…yet I do have a couple deer antlers that my dogs brought home to gift to me, so I kept them in a bowl to re-gift to them should I run low on doggie biscuits. Imagine my surprise when I started noticing these became all the rage for decorating LOL. I also keep the horses hoof trims for my dogs (they like to chew on them too). Maybe they’ll be next yrs. trend haha. Taxidermy: No. And I’m tired, tired I tell you, of antlers. Real and fake. I live in TX, so if it isn’t the real deal, and it isn’t western themed décor, horns on your wall are a big fat DON’T. Pastels: Eehh. I like my color with more vibrancy. Notice I didn’t say anything about shocking hues. Like Orchid. Or Emerald Green. A home should be a haven of rest and relaxation. How does one do that when the room is shouting at you? Schoolhouse: Yes. Along with any and all antique and vintage elements . . . as long as they are well incorporated and appear to be collected/handed down over time. Statement Lighting: Yes. Makes a room. Colorful front door: Yes. Curb appeal and a bit of whimsy. Painted furniture: I prefer beautiful wood finishes. A painted piece here or there is fine; but the super chippy look is passé. Gallery Walls: No. NO. Most of what I’ve seen looks . . . contrived. Over-thought. Over-decorated. The placing of objects in a room should seem somehow organic . . . natural. Dhurries: Yes. Yes to all rugs. All homes, all rooms should have rugs. But, then, I’m a cottage/bungalow type; we love our rugs. Yes to: bold light fixtures, shades of grey and pastels and yes to schoolhouse fun! To which we add blackboards, of course. NO WALLPAPER!!!!! As long as it took to take down my kitchen and 3 bathrooms full of wallpaper I will never put it back up. Paint color is so much easier to live with and change when you tire of it. I believe the Schoolhouse look will pass quickly. However, those Dhurries – Yum! I have been seeing them lately and want to make it work in my space. Thanks for the article. Looking forward to a great year. Loved this post. Thank you. I’m a realtor in Park CIty, Utah and we get such strong reactions to taxidermy that we encourage our sellers to take down the heads. People will fixate on them and they won’t look at the house. I’m not a fan of decorating with dead animals for a variety of reasons but I do like the white plaster heads. They’re sort of tongue in cheek. I’m loving the navy trend with metallics and pops of hot pink. I didn’t like radiant orchid at first but realized it’s a great way to liven up the neutrals that have overwhelmed everyone’s decor of late. My biggest decorating peeve are those twine balls. I’m still seeing them even though that trend should have died about 5 years ago. What is that all about? The twine balls, yes! They always struck me as a little strange, too. Funny how things like that can take off. Thanks Katie! I tend to stay away from trends unless it’s something that really speaks to my heart. With the millions of blogs online now, things seem to come and go pretty quickly and really many of the homes are starting to look the same. I will always like a colorful front door and I love some color in my rooms. My philosophy is decorate your home with what feels right to you. I like a home that reflects the personality of the people who live there not what’s trending on blogs and in magazines. I spent 3 days stripping wallpaper in my bathroom last summer. I vowed to never wallpaper again but I may change my mind in 10 years. I did wallpaper the inside of a french wall cabinet with a subtle pattern. Lots of opinions when it comes to decorating. It all boils down to doing what makes your heart sing. I’m not decorating my home for other people. Love this blog because I love house tours! I think wallpaper is definitely a harder sell for those of us who have had to strip it! Someone told me that the newer papers are easier to get off, but I don’t know if that’s true or not. Thanks, Sandy! I love some of the new decorating trends, especially the colored front doors. One other new trend for 2014 is how monogramming has gone mainstream. I think that monogrammed Euro pillows add a special touch to any room and give it a personalized look that makes it unique. I would think that crystal lighting would be on the list. It seems like it’s everywhere now, especially the drippy-rain crystal chandeliers. I love them but I fear the trendy feel in 10 years. Another thing not listed is the obsession with geometrical patterns… I used to love chevron and now it’s EVERYWHERE. I refuse to buy it because it’s going to be outdated so quickly. Very interesting comments here, I love all the opinions! Looking at the list, I like grays, redid our bathroom with gray walls, just a touch of gray in the granite and flooring. I don’t own a mountain cabin, so taxidermy is out. Wallpaper, while I don’t personally have any reminds me of my grandparents home and leaves me with a warm and fuzzy homey feeling. Changing out the brass for brushed nickel, not stopping in the middle of that one, lol! As for painted furniture, while we don’t have any in my home, I cringe when I see beautiful piece of wood with exceptional graining painted. Having said that I do paint furniture, but only if there’s nothing nice about the wood itself. There have been pieces that I’ve painted and stained so you can see the great wood graining of the piece. I haven’t tackled the front door yet…alas, HOA and paperwork just to get the okay. Thanks for letting me comment! Martha used acetone. I think paint remover can be used too. I am not sure what the upkeep would be on faucets. Interesting! Thanks for the link, Jeanne. I know taxidermy is not to everyone’s taste but personally I think if it is displayed in a suitable environment it can look extremely effective. I am SO over gray, but that might be because much of my house was painted gray about 7 years ago and I lived with it for 4 years and then painted over it. No to pastels–not my style. And I have some “taxidermy” type things, but they aren’t real animals. I think light fixtures are big. There are some gorgeous ones on the market. We did a bathroom recently and the selection has grown in my opinion. Just discovered you and have spent hours reading. 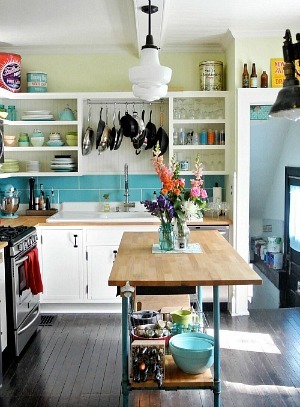 Current trend which I dislike: Open shelving in the Kitchen! It does look great in a photo shoot or on television with perfectly sparkling and interesting items on display. But in real life? Um… no. Dusty dishes? No thank you. Piles of my kids sippy cups? It’s just not practical. At all. I have to laugh at you all about the dusty dishes. This isn’t meant to be rude or ugly, but I just find it funny. If you have things on your shelves that you use they don’t get dusty. Just that simple. If you have shelves that you can’t reach with things you don’t use that often, they will get dusty, then you wash them. As far as sippy cups, put them in a cabinet with doors, because most likely you wouldn’t take down all of your cabinets and put up shelves. We removed some of upper cabinets and put in old shelving that we fould in our barn. I have dishes, glasses and things I use everyday on them, believe me they don’t have time to get dusty. I can reach all those things. But on higher shelves I have things that I don’t use that often, they do get dusty. The greatest thing about open shelves, besides being pretty is, nobody has to hunt for a glass or dish AND everyone can help unload the dishwasher and put the dishes away. Interesting article pointing out latest trends. I personally enjoyed your tactful dislike of the obvious i.e gray walls–really? Are we to spend our days inside a morgue only to brighten it with a pastel coffin? I get my inspiration from designers who rebuke trends and offer something that gives me that “I could have had a V8” moment. The only “trend” I would follow would be the painted door if you live in a home that can carry it off. Otherwise, less trends for me and more inspired designers. These trends are all 2 years old. Interesting. I’ve been painting and refinishing furniture for over twenty years. This started because I was poor and picked up cast-offs from the street and was inspired by my grandmother who kept furniture from generations of our family and refinished or repainted according to her whims. Every time I recycle or repurpose a piece of discarded furniture to suit my needs in my house I feel terrific and I picture my granny smiling down on me. That will never be just a trend. I’ve never used chalk paint though. What a limited palate it has, which defeats the purpose of painting in a color you want and it is expensive! Wallpaper is too much of a pain to change and I’m not the type to live with old designs on the wall for decades. Brass…I spray painted all my old brass pieces I inherited to fun aquas and teals together in a group display. Yellow metal just looks cheap and dated to me. Every time I see it in a photo, I think how much more elegant and fresh it could be in a different color. Taxidermy is really not anything I am remotely interested in outside a science museum. Too morbid and gruesome for my animal loving self. 1.Gray walls are for submarines and Navy ships not my house. 2.I’m tired of the back and forth between metals. It changes as much as does which way the baby sleeps: on its back or stomach? 4.Taxidermy – No way. It’s a hideous trend I can’t believe gained traction. 6. Wallpaper – Immune to this trend. I’ve spent hours stripping wallpaper. 9. Statement Lighting – It was a trend in my house years ago. All opinion, all a matter of preference, doesn’t really mean anything. One person’s horror is another’s delight. Build your surroundings with colors and decor that ,makes you comfortable. Who cares about the rest? It really is one of the few things in life that matters very little. And anyway, as fast as you decorate, styles will change. I’m also no on the taxidermy and pastels. Grey is alright but I really don’t like the grey/ yellow trend that’s going on – I remember it being in fashion for clothes in the late 90s/ early 2000s and it’s just so blegh for me. Don’t get it at all. The wallpaper feature walls are alright – the only thing is that it’s done to death by this point so it’s started to feel a bit overdone/ gimmicky to me. I actually like statement lighting but not in the way it often seems to be (like, ‘industrial light’ that’s never been in a factory) – I’m a big fan of retro designer lamps, e.g. pH lamps and the like. Retro futuristic is a very interesting style. I have to laugh because from the moment I saw industrial lighting it looked like a trend that would be dated upon arrival. The movie Flash Dance and every other “loft” setting for the screen has over-done this “oh my goodness I’ll just have to make do with this industrial setting and by the way isn’t it so edgy?” style. I wouldn’t touch industrial with a 10 foot pole. It looks contrived in my opinion. I am sick to death of grey and “greige.” Why on earth would any one want their home to look like a battleship–unless you happen to be an admiral or something. To me, grey looks like primer, and “greige” like dust. It’s depressing—I just can’t get on board with that trend. Taxidermy is another one that baffles me. I have always loved colorful front doors. Painted furniture is nice, too, unless the wood grain is just gorgeous and the finish is in good shape. I have rescued and painted quite a few old, banged- up furniture pieces! I notice that the gold fixture trend is not so brassy, but actually gold. It’s not my cup of tea, but I’ve seen it look nice in some photos. Love schoolhouse lighting, but I dislike the whole industrial thing. I agree with Jodi.